As Americans seek to make healthier choices, seafood is becoming more popular than ever before. In fact, U.S. consumers eat 50% more seafood now than they did 50 years ago and spend $80 billion annually on creatures from the sea, according to Oceana. Coupled with the increasing popularity is the growing problem of seafood fraud and mislabeled imports. Oceana’s study in 2013 performed DNA testing on seafood samples taken around the United States and found that nearly 33% of those samples were mislabeled. Lab technicians use the Hunter device during a test process. InstantLabs manufactures the Hunter system as well as test kits for food pathogens and species identification such as the catfish testing commercialization agreement outlined with the FDA. InstantLabs offers a series of DNA-based seafood tests for species identification. 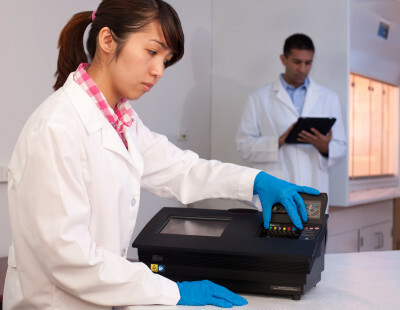 Last week the company announced a partnership with FDA to co-develop and commercialize a new Ictalurid catfish species identification test that enables much faster sequencing of samples and at a lower cost. “I think everyone is recognizing that the current method industry uses for validation, which is to take a sample and send it out to a lab for sequencing, just takes too long,” says Guterman. There is a typical time lag of about one to two weeks from taking a sample to getting a result. FDA and InstantLabs began talking about the technology about a year ago, as both have worked closely with the University of Guelph, according to Guterman. FDA was looking for a company that would be able to commercialize a test kit for U.S. catfish, and the new partnership is part of a Cooperative Research and Development Agreement (CRADA) with the agency. U.S. Farm Bill legislation states that only members of the Ictaluridae family can be legally marketed as catfish within the United States. The FDA-InstantLabs CRADA collaboration will help ensure the integrity of labeling related to U.S. catfish. The Pangasiidae species, which hails from Southeast Asia, has been increasingly mislabeled as U.S. catfish. This is not only a concern from a cost standpoint but also a safety perspective, as FDA has detected toxins in catfish that come from Asia.